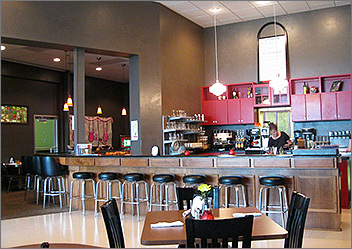 The Village Grille is a family-owned local restaurant, conveniently located in The Heritage Village Shoppes in Allouez, on the corner of East River Drive and Hoffman Road. They offer a full menu with homemade soups, salads, sandwiches and burgers as well as fresh perch on Friday nights. Espresso drinks, wine and beer are available for the adult crowd, while children can enjoy a full-service fountain and ice cream sundaes. This grill/pub is near our home and have been wanting to try it out, finally did and it was all positive. The waitress (Sue) was very friendly, we actually recognized her from a previous establishment. She had glowing things to say about the place, explained everything, etc. She even allowed lunch a little bit earlier than they serve it. The food was very good. I got the mushroom/swiss with grille fries which are cut up baby red's deep fried. My wife got the regular cheeseburger platter. Both were very good in taste, portions, and around $7/each total. The location is in a newer strip mall on the East River in Allouez. Its kind of hidden actually, but it was fairly full at the Saturday brunch time. There is an eating area that reminded me of almost a cafe style and then there is also a smaller pub area if you wanted to have some adult beverages. It probably isn't a hoping hangout but would be a good neighborhood pub to have a few drinks. But all in all it was an excellent experience and we will be returning. I went for lunch at the Village Grille in Allouez; it is located on the border of East Green Bay. As I walked in the restaurant I was aware of the pleasing 22 foot high ceiling with ceiling fans and the massive arched front window which gives the room such an open airy atmosphere and also situated throughout were many wooden black tables for seating. The walls are painted in dark charcoal grey and on one side of the wall is a unique display of red window frames with each square containing a mirror. Even though the ceiling is very high the acoustics were very good and there was soft music playing in the background. Towards the back of the restaurant there is a long counter with more seating and to the left is a tastefully decorated bar lounge area. The lounge area has a full bar with a counter with more seating, cocktail tables and colorful pieces of cut glass framed which adorned the wall. On each dining table was a red votive candle, a tiny glass vase with a silk flower, salt and pepper shakers and silverware rolled in paper napkins. I ordered one of their specials for the day, Baked Cod for $10.50 and a glass of freshly brewed iced tea with free refills for $1.50. The cod is served with coleslaw and rye bread with raw onion and I had a choice of potato salad, kettle chips or French fries. I requested if I could substitute the potato for steamed vegetables and it was no problem. My iced tea was brought out in a tall clear glass and my dinner platter contained an 8oz piece of cod with a side of melted butter, a slice of dark and light buttered rye bread with raw onion rings on top, a side of creamed coleslaw and a side of mixed vegetables placed in a ceramic coffee cup. 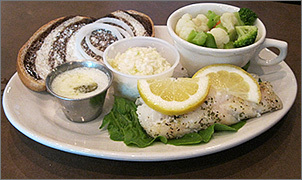 The cod was served hot and tasted ordinary, the creamed coleslaw was minced and had good flavor, the slice of bread was well buttered - soft and fresh, and the vegetables were frozen but cooked to tenderness. My server was cordial and efficient throughout my meal. Next time, one evening, I will have to sample one of Village Grille’s specialty drinks and sit in their pretty lounge area.